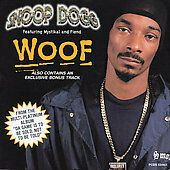 Snoop Dogg Releases Single "Woof"
"Woof" is the second single released from Snoop Dogg's third album, Da Game Is to Be Sold, Not to Be Told. It was produced by Beats By the Pound member Craig B and Master P and featured rappers, Fiend and Mystikal. It peaked at 62 on the Billboard Hot 100, 31 on the Hot R&B/Hip-Hop Songs and 3 on the Hot Rap Singles.